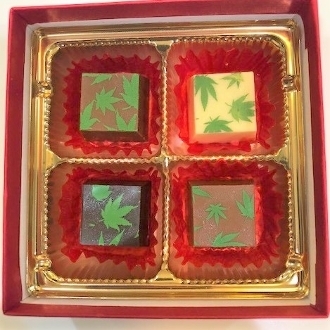 AVAILABLE IN THE STATE OF FLORIDA ONLY: Our amazing chocolate married with CBD. And then decorated with an adorable hemp leaf! This is a two box order. Each box contains 4 squares of solid chocolate each containing 15mg of pure Hemp tasteless CBD for a total of 60mg of CBD per box. No THC. So relax while enjoying our amazing chocolates! The CBD used in our products is made from NON-GMO, PESTICIDE FREE, CO2 Extracted Industrial Hemp Oil, and is third-party tested for purity. CBD is non-psychoactive. This is a 2 box order.